Welcome back to Messier Monday! In our ongoing tribute to the great Tammy Plotner, we take a look at the Triangulum Galaxy, also known as Messier 33. Enjoy! One of these is the Triangulum Galaxy, a spiral galaxy located approximately 3 million light-years from Earth in the direction of the Triangulum constellation. As the third-largest member of the Local Group of galaxies (behind the Andromeda Galaxy and the Milky Way), it is the one of the most distant objects that can be seen with the naked eye. Much like M32, M33 is very close to Andromeda, and is believed to be a satellite of this major galaxy. At some 3 million light years away from Earth, the Triangulum Galaxy is the third largest galaxy in our Local Group and it may be a gravitationally bound companion of the Andromeda Galaxy. Its beautiful spiral arms show multitudes of red HII regions and blue clouds of young stars. The largest of these HII regions (NGC 604) spans nearly 1500 across and is the largest so far known. By studying the eclipsing binary, astronomers soon knew their size, distance, temperature and absolute magnitude. But more was yet to come! In 2007, the Chandra X-ray Observatory revealed even more when a black hole nearly 16 times the mass of the Sun was revealed. The black hole, named M33 X-7, orbits a companion star which it eclipses every 3.5 days. This means the companion star must also have an incredibly large mass as well…. Quite the description indeed, since it would eventually lead to Rosse’s description of M33 being “…full of knots. Spiral arrangement. Two similar curves like an “S” cross in the center”, and to other astronomers discovering that these “spiral nebulae” were extra-galactic! While actually locating Messier 33 isn’t so difficult, seeing Messier 33 can be. Even though it is billed at nearly unaided eye magnitude, this huge, low surface brightness galaxy requires some experience with equipment and observing conditions or you may hunt forever in the right place and never find it. Let’s begin first by getting you in the proper area! 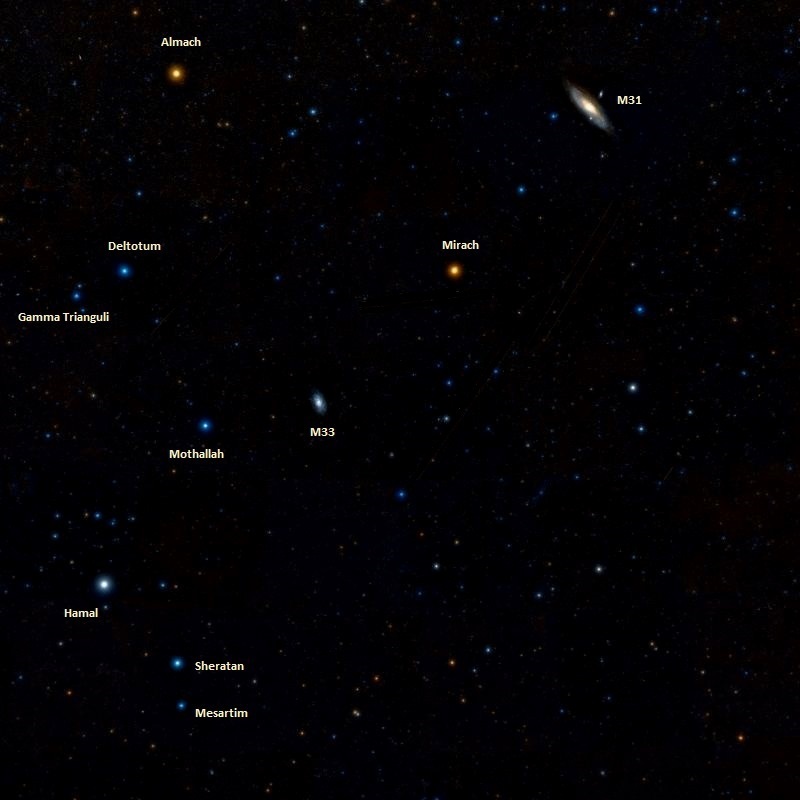 First locate the Great Square of Pegasus – and its easternmost bright star, Alpha. About a hand span further east you will see the brightest star in Triangulum – Alpha. M33 is just a couple of degrees (about 2 finger widths) west. Now, the most important part to understand is that you must use the lowest magnification possible, or you won’t be able to see the proverbial forest because of the trees. The image you see here at the top of the page is around a full degree of sky – about 1/3 the field of view of average binoculars and far larger than your average telescope eyepiece. However, by using the least amount of magnification with a telescope you are causing M33 to appear much smaller – allowing it to fit within eyepiece field of view range. The larger the aperture, the more light it gathers and the brighter the image will be. The next thing to understand is M33 really is low surface brightness… Light pollution, a fine haze in the sky, moonlight… All of these things will make it difficult to find. Yet, there are places left here on Earth where the Triangulum Galaxy can be seen with no optical aid at all! Enjoy your quest for M33. You may find it your first time out and it may be years before you see it in all its glory. But when you do, we guarantee you’ll never forget!